One of the very best in New Wave one hit wonders, Sniff 'n' The Tears' "Driver's Seat" had a fast four on the floor beat, led by the constant snare drum snap on the 8th notes. This was a rock toe-tapper in every sense of the word, backed by the hard acoustic guitar strums of lead singer/songwriter Paul Roberts, all based on three chords. New Wave was probably the last great period of danceable rock and roll, with plenty of short named bands, or just slightly twisted ones like these guys. "Driver's Seat" was made for the skinny tie crowd with that pulsating snare beat. Tightly arranged, "Driver's Seat" has a very cool production trick at the song's start that bears a few listenings. I'm actually convinced it may have been an accident. The song's three acoustic guitar chords are played hard twice through, then the drums come in with that precision beat, but it sounds like somebody let the reverb go on for a couple of seconds, and then dial it back quickly back down down. It's a slightly subtle effect, and if you listen to the official video below in the first 10 seconds, you'll distinctly hear it. "Driver's Seat" is one of the New Wave era's two big driving songs (the other was the Tom Robinson Band's "2-4-6-8 Motorway"), much in classic rock's tradition like Golden Earring's "Radar Love" and Thin Lizzy's "The Boys Are Back In Town." You crank it up in the car for a few good reasons -- 1) the pulsating beat, 2) it's about driving and 3) it's a great song, so what other reason do you need? Doing alright, a little drivin' on a Saturday night. And come what may, gonna dance the day away. Jenny was sweet, show a smile for the people she meets. I'm trouble, let's drive, I don't know the way you came alive. News is blue (the news is blue), has its own way to get to you. What can I do (what can I do), when I remember my time with you. Pick up your feet, got to move to the trick of the beat. There is no lead, just take your place in the driver's seat. Paul Roberts had the required disaffected lead singer tone of New Wave bands, his being a bit light and rough around the edges. The background vocals are derivative of doo wop, of all things, with a basso singer doing the "yea-aah" during the brilliant a capella break, and at other times, brilliantly echoing some of the lines with shuffled variations ("What can I do-o-o-o?"). Other highlights: fuzz guitar lines, octave guitar chords, and the square wave synth solo that twists and turns around the last part of the song. 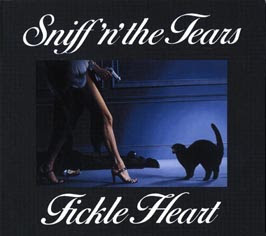 Got to love the fact that you can buy a "Best of Sniff 'n" The Tears" CD, but there was only one real hit for the band. Below is the official video, which is amusing for three reasons 1) Paul Roberts is playing an electric Fender Telecaster but the part is an acoustic guitar, 2) the band's debut album cover conveniently laid across the prominently viewed kick drum, and 3) the cheek and sexist camera pulling away from that kick drum revealing the drummer placed perfectly between a pair of girl's legs. That's followed by the band's appearance on "Top Of The Pops" (Where Roberts at least has the acoustic guitar this time!). Who is the black background singer in this video? He has the coolest attitude ever. I have been searching for this mans name for months and cannot find him anywhere. Why isnt he being given credit for the music video? I agree he is one cool customer and he made the video pop. The lead singer was milktoast. I thought I saw him recently on a commercial for a diabetes drug where he was in a prop plane going down the road slow and easy. Anyone know if that is him and his name?